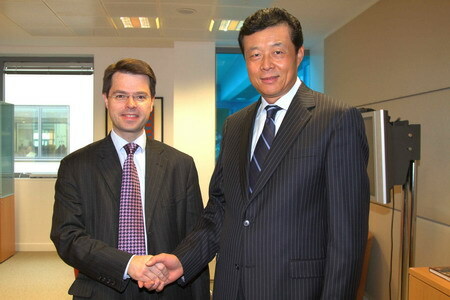 On December 13, Ambassador Liu Xiaoming met with Mr. James Brokenshire, Parliamentary Under Secretary of State at the Home Office. Ambassador Liu said that the current China-UK relations are developing well, and the two countries have carried out efficient, pragmatic and fruitful cooperation in the fields of law enforcement, immigration, etc. China is ready to maintain close contact and dialogue with the UK to enhance the bilateral cooperation in the fight against drug trafficking, human trafficking, organised crimes and other aspects. Ambassador Liu pointed out that with the rapid development of China-UK relations, the two countries have more frequent and closer personnel exchanges and cooperation in the fields of economy, trade, education, etc. The Chinese side notes that the British government has recently introduced a new immigration policy, and hopes that the British side will fully consider China's interests and properly handle the UK visa and immigration issues for Chinese citizens, so as to create favorable conditions for the normal personnel exchanges and cooperation in various fields between the two countries. Mr. Brokenshire agreed with Ambassador Liu on his positive comments on the bilateral cooperation in law enforcement and immigration, saying that UK attaches great importance to its cooperation with China in combating drug trafficking, human trafficking, transnational organised crimes as well as kidnapping, extortion, and cybercrime. He hoped the two sides will continue the close dialogue and cooperation to effectively prevent and combat crime. The British side attaches great importance to China’s concerns on the new immigration policy, and is ready to engage China in active and practical discussions to find a solution.